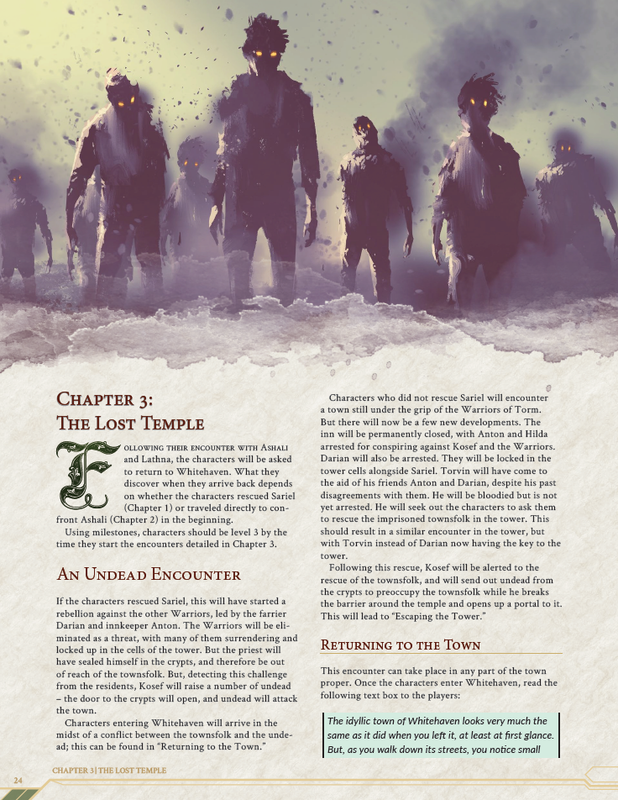 Save an entire town from an undead invasion – and its own prejudices, with this excellent Tier 1 adventure. A review copy of “The Priest, The Witch, and the Lost Temple” was provided by the publisher. Find more DMs Guild Reviews on my website and YouTube channel. Although its title may bring fond memories of Narnia, “The Priest, The Witch, and The Lost Temple” is more akin to The Lost Mine of Phandelver – and that is indeed high praise. The low level adventure is designed for levels 2-3 and features a town in need of saving, exceptionally detailed NPCs, and several satisfying dungeon crawls. The adventure takes place in the town of Whitehaven, located in the hills east of Neverwinter Wood and north of Triboar – prime Sword Coast country. Several solid Adventure Hooks are provided that draw upon the region’s history and factions. Due to its location, the adventure could fit snugly into a Storm King’s Thunder campaign, though its theme is centered around the undead rather than anything to do with giants. The first chapter covers the entire town of Whitehaven, which reminded me of Phandalin. Each of its NPCs is thoroughly detailed, has a full backstory, and has a role to play in the ongoing conflict. A powerful wizard from Thay who lives nearby is being blamed for a recent undead incursion. Ashali does have a sordid past as a Red Wizard, but is trying to build a new life with the lover she ran away with. Instead it’s the town priest who has descended into evil, stealing one of Ashali’s books, communicating with her old master, and working to unseal a hidden temple below the town that contains an ancient evil artifact. The history of the town and its current events are extensive and thoroughly detailed. Every NPC, from the widower Blacksmith to his rebellious teenage daughter and the Harper farrier has motivations, goals, and history that tie them to Whitehaven and its people. A mini-dungeon crawl is provided in the form of a tower taken over by the local bandits, where the PCs can rescue the farrier’s daughter. Whitehaven provides a great mix of role-playing, exploration, and combat, though unfortunately lacks a map. The PCs should pick up several quests in town, including traveling to Ashali’s exotic home in the nearby hills to question or confront her. Again I’m reminded of Lost Mine of Phandelver where the PCs are free to roam the region and tackle various tasks. Like Phandelver each of these areas are much more than just a random encounter, presenting fun little story moments, like the undead paladin who has risen but refuses to cut down his undead compatriots, or some goblins who are dealing with the startling scene of watching their fallen brethren rise up as zombies. Though it’s entirely possible and likely that the PCs will eventually ally with Ashali, her magical home is thoroughly warded and protected, providing a trap-filled, magic-themed dungeon crawl with spell-book mimics, awakened trees, and an unseen servant chef. The PCs find her communing with a demon, which looks bad, but is just her way of investigating the undead threat. I love the way events unfold as the PCs return to town in chapter three, depending on if they had dealt with the local bandits yet. The town’s civil war soon boils over into undead invading from the crypts, with our heroes heroically saving townsfolk and journeying down to find the town priest stepping through a portal and becoming an undead baby-lich. The NPCs of the town are given their various moments to shine, and Ashali swoops in to hold the portal open so the PCs can step inside and slay the undead priest in an epic battle. All the events are set up to maximize the potential of the story without feeling like the players are railroaded into a set path. Lots of meaningful choices and role-playing opportunities are presented throughout the adventure, yet we also get really fun “cutscenes” like the first meeting with the priest and the Warriors of Torm, Ashali and the demon, Ashali and the portal, and approaching the final battle as the priest battles a bodak. I’m very impressed by the amount of content packed into a relatively short, yet detailed adventure. It’s everything I want from a DMs Guild adventure: easy to drop into an existing campaign, tells a complete story, and features richly themed dungeons and three dimensional NPCs. Packs in four distinct dungeon crawls: a bandit tower, a mage’s magically defended home, an undead crypt, and an unholy temple, and each has a map. Detailed NPC backstories, relationships, and roleplaying notes. Intriguing side quests that take advantage of the undead uprising theme. Satisfying, fun, action-packed finale involving the whole town. I’m not a fan of the Dyson Logos-style dungeon maps. No map of the town, nor of the side quest areas in chapter 2. 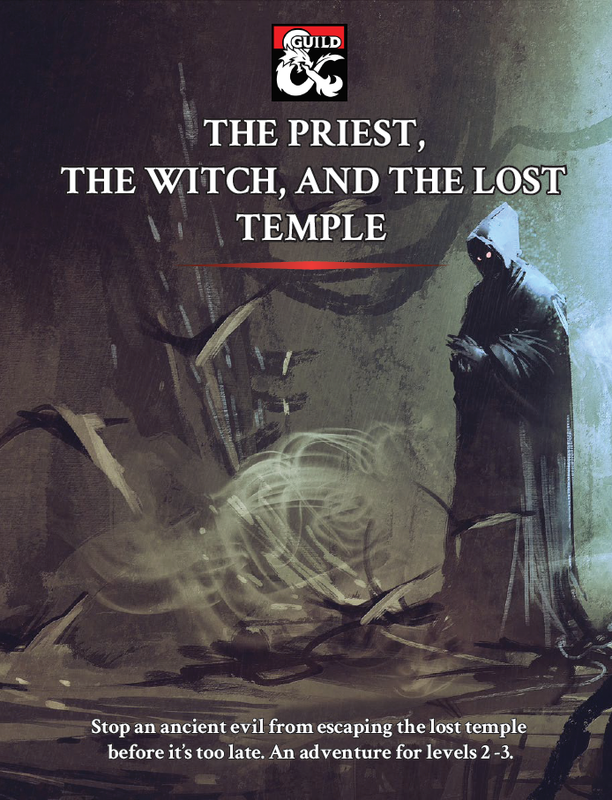 The Verdict: With a compelling overarching story, detailed NPCs, multiple dungeon crawls, and a wonderful balance between combat, exploration, and role-playing, “The Priest, The Witch, and the Lost Temple,” is one of the most complete Tier 1 adventures on the DMs Guild.